Christians everywhere celebrate the feast of St. Francis of Assisi on October 4 or the first Sunday of October by having their pets blessed in the spirit of this patron saint of animals and ecology. He is known as the patron saint of animals, the environment and one of the two patrons of Italy (with Catherine of Siena), and it is customary for Catholic churches to hold ceremonies blessing animals on his feast day. 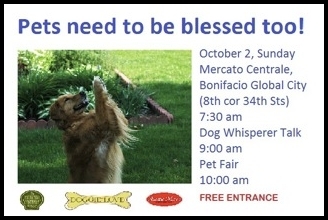 On the first Sunday of October, this coming October 2, Mercato Centrale, the lifestyle Market at The Fort, BGC will have a mass and a special blessing for the animals marking the feast day of St. Francis of Assisi. The mass, blessing and succeeding events are open to all animal lovers. Please bring all your pets.